Do I Really Have to Start My Whole30 Over? 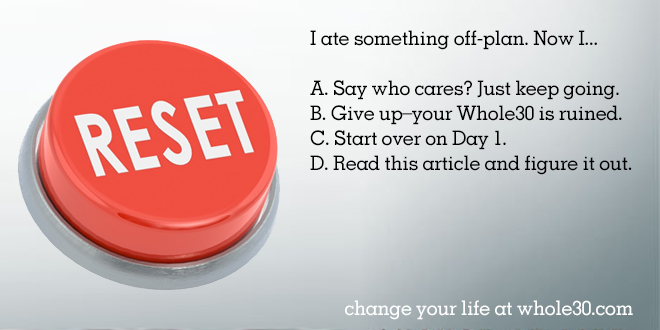 This question comes up all the time—“I ate something off-plan during my Whole30. Do I really need to start over?” Today, we’ll tackle the nuances of this question, and throw in a little of that famous Whole30 tough love. Ouch. Granted, this was posted on our personal blog and not a website read by millions, but our tough love used to be a lot tougher.  We’re really happy with the way the program (and the language) has naturally softened throughout the years to accommodate our fast-growing audience—but that doesn’t mean we’ll compromise on what we consider to be one of the most important rules. Do I Really Have to Start Over? Which brings us back to the question at hand: If you eat something off-plan during your Whole30, do you have to start over? Answer #1: Yes, because those are the rules. It’s super-duper clear right in the Whole30 program rules, you guys. No slips, no cheats, no special occasions. The program requires 30 days straight of 100% compliance, otherwise, it’s back to Day 1 for you. There, wasn’t that easy? This is especially true for those of you who start off deciding you’re going to do the Whole30 “with a break in the middle for my friend’s birthday.” We see this all the time on social media, and frankly, the fact that you announce it and then tag us is kind of a mystery. Listen up—you either do the program or you don’t. 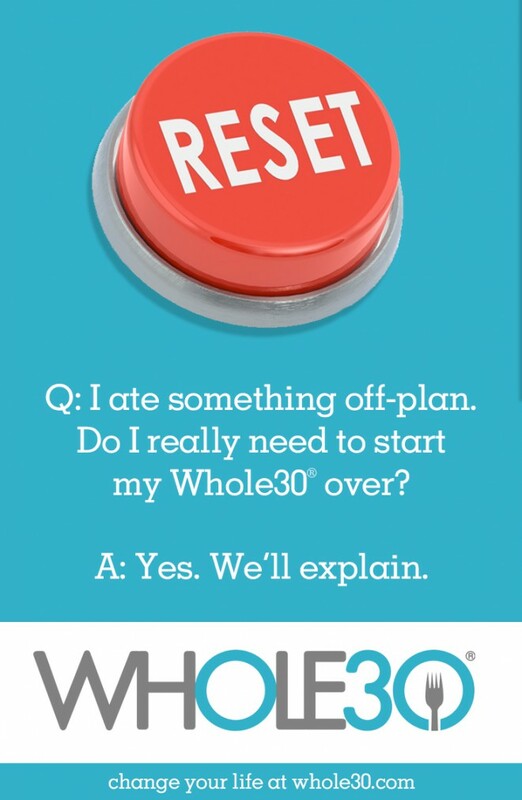 The Whole30 has no breaks. If you want to do the Whole30, then do it, and either start after the special occasion or figure out how to enjoy your life without mojitos and cheese. We recommend the latter, because we haven’t had a mojito or cheese in ages, and we’re still happy and fun. Wait, “because we said so” isn’t good enough? Fine. Answer #2: Yes, because you made a commitment to yourself. Don’t start over because we want you to—start over because you promised yourself you’d see this through, and we want you to honor that commitment. You decided to push the reset button on your health, your habits, and your relationship with food, and change your life through the Whole30. So see that commitment through. If you make an off-plan choice during the 30 days, we want you to want to start over. Because you said you would. Because you owe it to yourself. Because you deserve it. Because the sense of self-efficacy that comes with tackling something as daunting as the Whole30 will spill over into all of the other areas of your life, setting off a good-health-be-good-to-yourself chain reaction that never, ever has to end. Answer #3: Yes, because science. The point of any elimination diet is to completely remove 100% of the potentially problematic foods from your life for a full 30 days straight. Without the complete removal, your body won’t experience what life is really like without these triggers. You may think one beer or one piece of pizza won’t really make a difference, but if you’re sensitive to these foods, you require only a tiny amount to break the Whole30 “reset”—to disrupt the gut, fire up the immune system, and potentially trigger the symptoms of your condition. Think about it like an allergy—if you’re truly allergic to peanuts or shellfish, how much does it take to provoke that allergic response? Just one tiny peanut or one bite of shrimp matters. And while we’re not just talking about allergies here, the principles are the same—the point of elimination is full elimination. Now, you might say, “But if I was sensitive, I’d know it.” Uh, no. You would not. Nobody knows they’re sensitive until something happens to make them realize they’re sensitive. We know Celiacs who walked around eating bread for decades before they realized there was a problem. The point of the Whole30 is to identify sensitivities. So until you’ve done the full Whole30 by the books (which means 100% compliance for a full 30 days), you may not know. This is especially true of grains (especially gluten), dairy products, soy, peanuts, and alcohol (any form of which is known to promote gut permeability). This argument doesn’t hold up when you’re talking about added sugar, however. Answer #4: We can see a circumstance in which you wouldn’t. The rule about added sugar is clear—you may consume none during the program. This isn’t because two grams of sugar in ketchup is going to send you spiraling into metabolic derangement or trigger an autoimmune response. It’s because we want you to be aware of how often companies sneak sugar into products, and to understand that a few grams here and a few grams there add up, and to teach you to read your labels, and to force you to look for (or make) healthier, sugar-free alternatives to your favorite products. Answer #5: Do whatever you want, because you’re a grown-up. Start over, don’t start over… it’s always up to you. 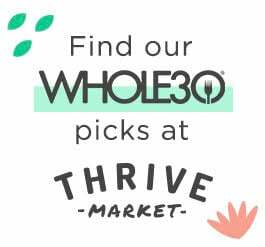 We’re going to give you our best recommendations based on science and our vast experience, but no one is going to come to your house to check up on you, and no one is monitoring your Whole30 Daily emails to make sure you push the right button. The decision (like the consequences) are always yours and yours alone. Are You Always Starting Over? Finally, one last note. If you find you’re one of those people who are always starting over—you just can’t seem to make it past Day 3 or Day 10 or whatever—that tells us there’s something to look at here. If this is your story (and you are not alone), we invite you to take a good, hard look at what may be blocking or sabotaging the commitment you made to yourself and the program. Maybe you’re just not planning well enough, in which case we have a ton of free resources here to help you overcome that hurdle. But more likely, there’s a psychological or emotional issue standing in the way of you and your health goals. If that’s the case, take a good, hard look at what’s going on, either on your own, with friends and family, or with a trusted counselor. 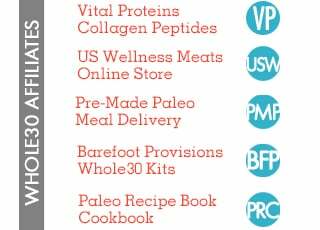 See if you can identify your own personal road blocks, see if you can find a way to clear them, and in the process, determine whether the Whole30 is really the right program for you at this time.